Congrats on your DT position, my DT post on the Fiskarettes blog was one of my first and I had so much fun playing with all the products. Can't wait to see what you create! Well done Vicky, DT places aren't as easy to come by as you make it sound! Must say I like the look of the 'solid'ness of that stamp wheel...hope Fiskars can produce them at better prices than I 've seen so far. Can't wait to be wowed with your samples! Your desk always looks so organised Vicky...unlike mine at the moment! Look forward to seeing your fab designs. Congratulations on the DT post Vicky, that new Fiskars product looks interesting can't wait to see what you make with it!! ooh have you ever played with the indian wood ones? You are on fire, keep smiling and creating. New toys are the BEST!! You must've been sprinkled with some lucky fairy dust...but you deserve all this good luck, that you seem to be having at the moment!! Congratulations on the DT position and can't wait to see what you design! How Exciting with the DT Position.. Cool.. I can't wait to see all your CREATive-ness with the Fiskarettes roll thing.. Th anks for stopping by my blog. Mandy Blessings to you!! Oh I'm over the moon for you - congratulations Vicky on being chosen to be a Fiskarette. I'm really looking forward to seeing you make with the products. 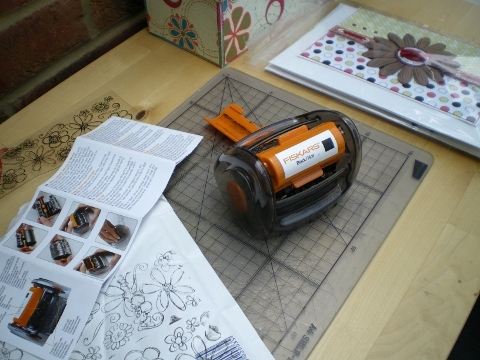 Great news...wishing you lots of inspiration and creativity - and fun with the Fiskars gadget there!